Computers automatically aborted the countdown Saturday for SpaceX's first commercial flight to the International Space Station, scrubbing the launch a half-second before liftoff of the Falcon 9 rocket. Higher-than-allowable pressure inside one of the Falcon 9's first stage main engines were detected after ignition as flames and smoke erupted around the base of the 15-story rocket at 4:55 a.m. EDT (0855 GMT). As engineers studied what went wrong, the SpaceX launch team began draining kerosene and liquid oxygen propellants from the two-stage rocket. There was no time to attempt a second countdown Saturday because the Falcon 9 had only a near-instantaneous window to launch and reach the space station. And in order to preserve fuel for test maneuvers on the way to the complex, SpaceX only has launch opportunities on certain days. The next try will come no sooner than Tuesday at 3:44 a.m. EDT (0744 GMT). After inspections later Saturday, engineers decided to swap out a faulty check valve in engine No. 5, which lies in the center position on the Falcon 9's tic-tac-toe pattern of nine Merlin first stage engines. "Today's launch was aborted when the flight computer detected slightly high pressure in the engine 5 combustion chamber," SpaceX said in a statement. "We have discovered root cause and repairs are underway." "During rigorous inspections of the engine, SpaceX engineers discovered a faulty check valve on the Merlin engine," company spokesperson Kirstin Brost Grantham said in a statement Saturday evening. "We are now in the process of replacing the failed valve." SpaceX expected to complete the repairs Saturday night and continue analysis Sunday. 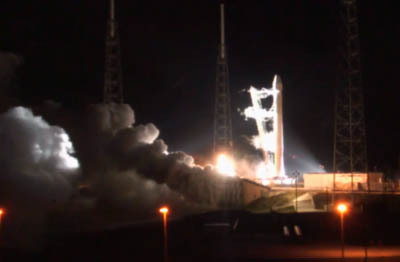 The last-second abort Saturday came after a smooth overnight countdown. SpaceX is seeking to become the first private company to launch a spacecraft to berth with the International Space Station.